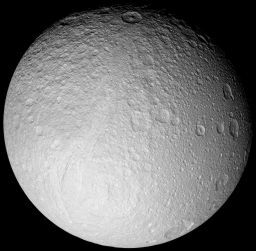 Dione and Tethys: New members in the club of active bodies? The European Space Agency issued a press release yesterday stating that Saturn's moons Tethys and Dione are "flinging great streams of particles in to space....The discovery suggests the possibility of some sort of geological activity, perhaps even volcanic, on these icy worlds." So far, the list of bodies in the solar system that have been caught in the act of some kind of geologic activity is very, very short. There are four: Earth, Jupiter's moon Io, Saturn's moon Enceladus, and Neptune's moon Triton. There are other bodies whose relatively crater-free surfaces suggest that activity has taken place recently (such as Venus, Jupiter's moon Europa, and Saturn's moon Titan), but Earth, Io, Enceladus, and Triton are the only ones who have displayed incontrovertible evidence that they're active right now. So if it's true that Cassini has observed Dione and Tethys being active, then the list of active bodies in the solar system has suddenly become 50 percent longer than it was before. They'd be very surprising additions, because these two worlds do not look the part; they're both heavily cratered -- Tethys especially -- indicating that their surfaces have changed very little for billions of years. So what's the basis of this announcement? It refers to a paper that was published in today's issue of the journal Nature: "Tethys and Dione as sources of outward-flowing plasma in Saturn's magnetosphere." The paper reports the detection of plasma -- charged atoms -- flowing outward in Saturn's spinning magnetosphere, a measurement made using Cassini's Plasma Spectrometer. As is true of most spectacular-sounding press releases, the story told in the actual research paper is more circumspect than the one told to the media. In this case, the paper does not actually mention the possibility of geologic activity of any kind on Tethys and Dione (much less does it mention volcanism). Instead, it states only that there are "distinct plasma tori associated with [Dione and Tethys]." Now, plasma tori ("tori" is the plural of "torus," which is a 3-dimensional figure that looks like a doughnut) are definitely associated with active bodies like Io and Enceladus, so to report that there appear to be plasma tori associated with Tethys and Dione is very interesting. But it's not conclusive evidence that those two moons are active, and the paper never actually states that they are. OK, so there is suggestive evidence that Dione and Tethys might possibly be doing something interesting geologically. At the same time, their appearance -- both heavily cratered, especially Tethys -- tends to make me skeptical that there's much going on inside them. What's the next step? When the magnetometer team discovered that Enceladus was disturbing Saturn's magnetic field, they argued very strongly for closer flybys of Enceladus that might allow Cassini's other instruments to detect an atmosphere there. In the end, it took nearly all of Cassini's instruments acting in concert over three close flybys of Enceladus -- one of them passing right by the active south polar region -- to nail down the existence of the south polar geysers, and there's still plenty to learn there. So much, in fact, that after the primary mission (which includes one more close flyby) ends, Cassini's extended mission calls for seven more close Enceladus flybys. How about Dione? There was one 500-kilometer flyby already, on October 11, 2005, and there'll be one more in the extended mission; I'm not sure if 500 kilometers is close enough, and I don't know if the geometry is correct, for Cassini to catch Dione in action. For Tethys, the only reasonably close flyby to date was on September 24, 2005, at 1,500 kilometers; the extended mission doesn't call for anything much closer than that. Although the Enceladus story was really pinned down with measurements that needed to be made up-close by the fields and particles instruments (magnetometers, particle detectors, and mass spectrometer), important evidence came in the form of images and temperature measurements made from a distance by the cameras and thermal infrared spectrometer. Pictures of Enceladus taken from "high phase angles" -- that is, where the Sun shone from nearly behind the Moon, illuminating the fine particles in the plume from behind -- really showed off the geysers. I dug in to the data that's been released to the Planetary Data System to find the high-phase views of Enceladus to date. These three observations were made on January 16, February 17, and November 27, 2005 from phase angles of 147 to 161 degrees, and the two on the right clearly show the geysers sprouting from the south pole. 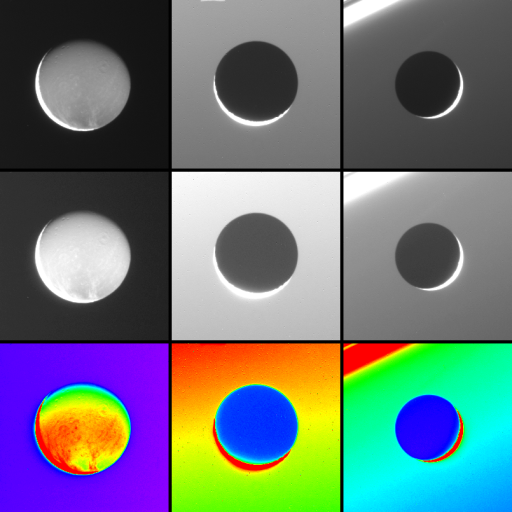 The first row of images are not stretched; the second has had the contrast adjusted to show off the plumes more; and the third row has had a color table applied to emphasize the plumes. Have there been similar images of Dione, and are there any plumes from Dione? There are similar high-phase images, but I just can't convince myself that I've seen any plumes. 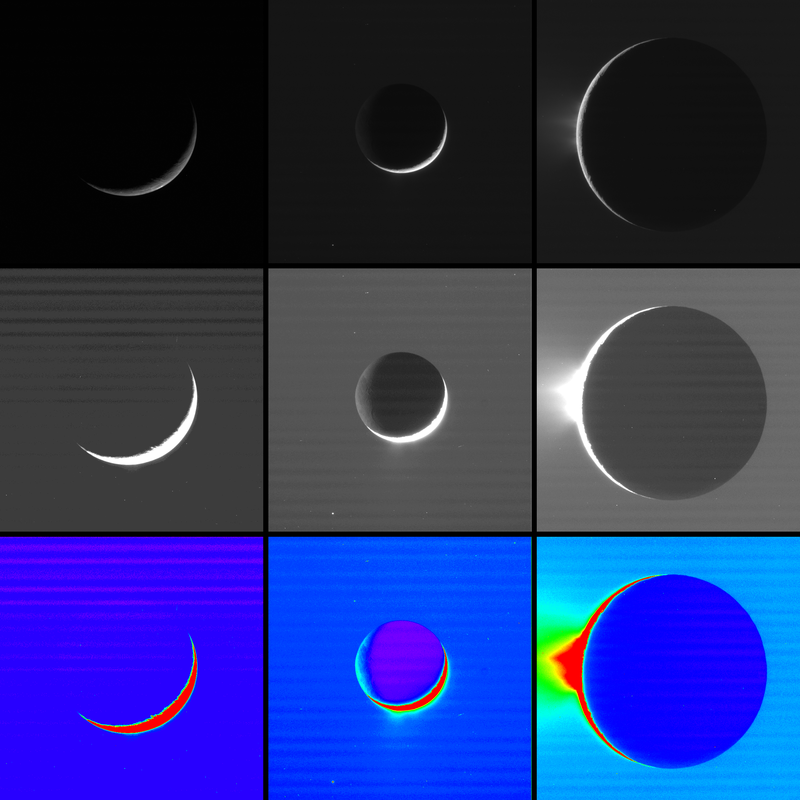 These three observations were made on October 11, 2005 and March 23 and May 3 of 2006, and I've stretched and colorized them in the same way that I did the Enceladus pictures above. The middle image has a smudgy appearance near the bottom of the disk, but it also has an unusually bright background, so I'm not at all sure what I'm seeing. We definitely need more data, from other instruments, captured much closer to Dione, in order to address the question of its activity. But if Dione and Tethys are active there is no reason to assume that their activity takes the same form as the strange south polar plumes on Enceladus. There's no strange south polar terrain on either body. Dione does have the "wispy terrain," revealed by Cassini to be very bright fractures crisscrossing one hemisphere. If Dione does have some intrinsic geologic activity that is spewing particles into Saturn's magnetosphere, my money is on the wispy terrain as the source region. 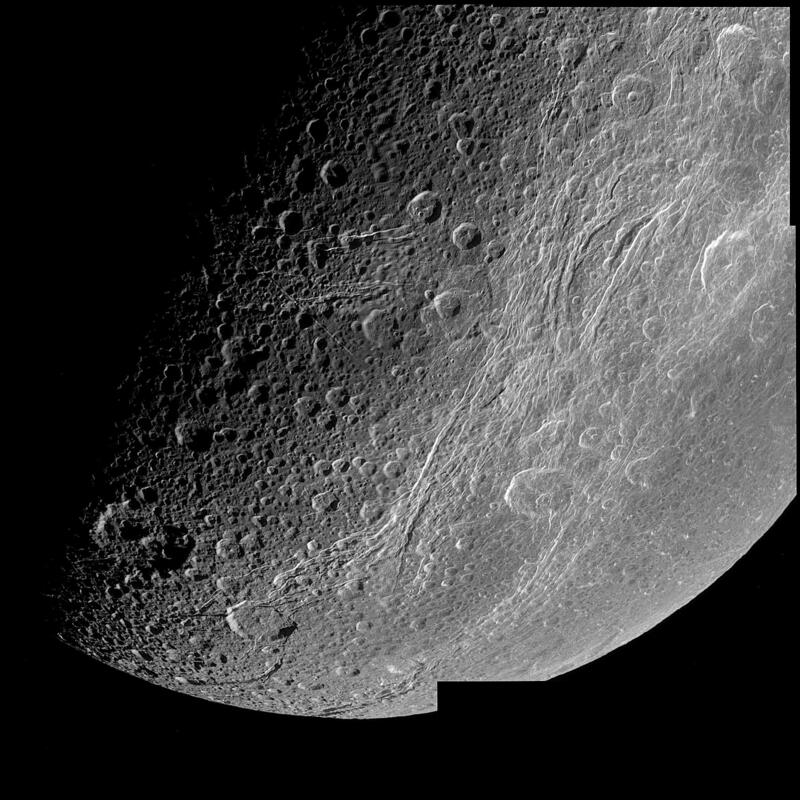 A mosaic of four images from Cassini's December 14, 2004 flyby of Dione solved the mystery of Dione's wispy terrain: it is actually the bright walls of many parallel fractures cutting the icy moon's surface.